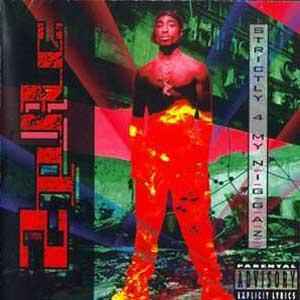 2Pac ‎– Strictly 4 My N.I.G.G.A.Z. Published By – Ba-Dake Music, Inc. Produced For – Bobcat Music, Inc.
After a promising debut album 2Pac released his second album, Strictly For My N.I.G.G.A.Z. Despite it not being my personal favourite 2Pac album I can’t deny that it is a pretty descent album with some quality songs on it. Although the lyrical themes of the album don’t differ that much from his first release, this album definitely has a different style. In all aspects 2Pac’s second release is cranked up a notch. Emotions in the songs come in just a bit stronger on this release. When angry, a bit angrier and when smooth a bit smoother. Production is a bit tighter and 2Pac himself sounds more confident on Strictly For My N.I.G.G.A.Z. Objectively reviewed this is just a strong release from an artist who lived up to the expectation. While writing and reviewing I realised I can’t even recall why I didn’t feel so strong for this release. I think I’ll spend the afternoon giving this album a second chance for a first impression. Wouldn’t be the first time a record grows on me over time. As they say, quality is a distinguished taste.